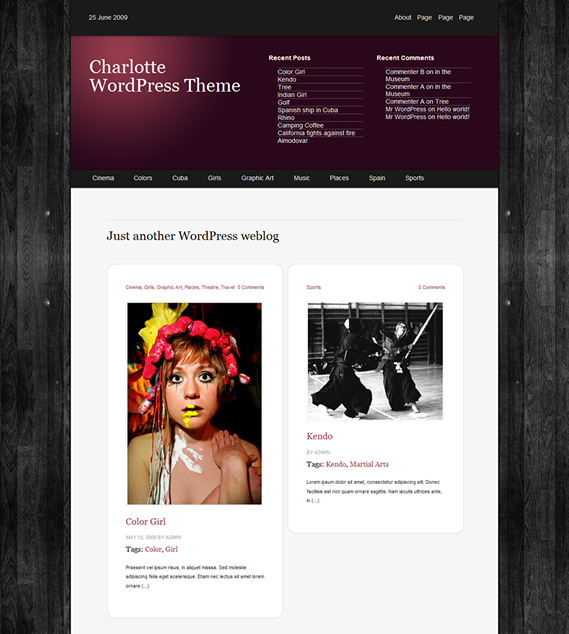 The Charlotte WP Theme has been released by Ignacio a Spanish designer & developer. His themes are showcased at wp.paragraphe.org and we recommend having a good look through his work. Charlotte is free and has been designed for use as portfolio theme. The home page keeps its emphasis strongly on your work. Using a showcase style Charlotte keeps its looks as far away from the typical ‘WordPress blog’ as possible, displaying everything in a clean, easy to navigate style. You posts / work are displayed in nice round cornered boxes on the home page in two columns, anyone familiar with wp portfolio themes or sites such as Notcot.org will know how successful this style of layout can be. Each posts main feature is the photo or image of your work, followed by the posts title, author, tags and the first paragraph of text (the excerpt) from the posts main page. We really like the way the tags have been implemented here. Portfolio themes are not always easy to navigate but by using this method of tagging the user can always find other similar posts easily and quickly. Ignacio has also used a similar navigation method for the categories which display in much smaller text at the top of each posts box, giving the visitor a more general search option for other similar items. Free theme under the GPL license. Valid Code as HTML 4.01 Strict. Using the Blueprint CSS Framework. 5 Photoshopped Colorful Headers to choose from. Widgetized Sidebar, Footer & Header. As you can see from the demo (link at the top of the page) each posts individual page is styled just as beautifully and Ignacio has built in a separate wigitized sidebar system which with a bit of thought could be used for anything from exif data if you are a photographer to sales links for your work / adverts if you run a gadget blog or similar. Charlotte comes with five photoshopped headers to choose from but obviously you can restyle this theme very easily to suit your brand or personal style. Overall we are very impressed with Ignacio’s work and we think that Charlotte WordPress Theme is a shining example of what he is capable of. Definitely one to bookmark and keep an eye on in the future!